Wuhan (simplified Chinese: 武汉; traditional Chinese: 武漢; pinyin: Wǔhàn [wùxân] ( listen)) is the capital of Hubei province, People's Republic of China, and is the most populous city in Central China. It lies in the eastern Jianghan Plain at the intersection of the middle reaches of theYangtze and Han rivers. Arising out of the conglomeration of three cities, Wuchang, Hankou, and Hanyang, Wuhan is known as "the nine provinces' leading thoroughfare"; it is a major transportation hub, with dozens of railways, roads and expressways passing through the city. Because of its key role in domestic transportation, Wuhan was sometimes referred to as the "Chicago of China." It is recognized as the political, economic, financial, cultural, educational and transportation center of central China. The city of Wuhan, first termed as such in 1927, has a population of 10,020,000 people (as of 2011), with about 6,434,373 residents in its urban area. In the 1920s, Wuhan was the national capital of a leftist Kuomintang (KMT) government led by Wang Jingwei in opposition to Chiang Kai-shek, as well as wartime capital in 1937. With a 3,500-year-long history, Wuhan is one of the most ancient and civilized metropolitan cities in China, more ancient than Beijing, Xi'an and Nanjing. During the Han Dynasty, Hanyang became a fairly busy port. In the 3rd century AD one of the most famous battles in Chinese history and a central event in the Romance of the Three Kingdoms—the Battle of Red Cliffs—took place in the vicinity of the cliffs near Wuhan. Around that time, walls were built to protect Hanyang (AD 206) and Wuchang (AD 223). The latter event marks the foundation of Wuhan. In AD 223, theYellow Crane Tower (黄鹤楼) was constructed on the Wuchang side of the Yangtze River. Cui Hao, a celebrated poet of Tang Dynasty, visited the building in the early 8th century; his poem made it the most celebrated building in southern China. The city has long been renowned as a center for the arts (especially poetry) and for intellectual studies. Under the Mongol rulers (Yuan Dynasty), Wuchang was promoted to the status of provincial capital; by the dawn of the 18th century, Hankou had become one of China's top four most important towns of trade. In the late 19th century, railroads were extended on a north-south axis through the city, making Wuhan an important transshipment point between rail and river traffic. Also during this period foreign powers extracted mercantile concessions, with the riverfront of Hankou being divided up into foreign-controlled merchant districts. These districts contained trading firm offices, warehouses, and docking facilities. In 1911, Sun Yat-sen's followers launched the Wuchang Uprising that led to the collapse of the Qing Dynasty and the establishment of the Republic of China. 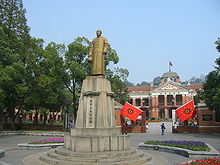 Wuhan was the capital of a leftist Kuomintang government led by Wang Jingwei, in opposition to Chiang Kai-shek during the 1920s. In 1938, Wuhan and the surrounding region was the site of the Battle of Wuhan, a major conflict in the Second Sino-Japanese War. After being taken by the Japanese in 1938, Wuhan became a major Japanese logistics center for operations in southern China. In December 1944, the city was largely destroyed by U.S. firebombing raids conducted by the Fourteenth Air Force. In 1967, civil strife struck the city in the Wuhan Incidentas a result of tensions arising out of by the Cultural Revolution. During the Second Opium War (known in the West as the Arrow War, 1856–1860), the government of Qing Dynasty was defeated by the western powers and signed the Treaties of Tianjin and the Convention of Peking, which stipulated eleven cities or regions (including Hankou) as trading ports. In December 1858, James Bruce, 8th Earl of Elgin, High Commissioner to China, led four warships up the Yangtze River in Wuhan to collect the information needed for opening the trading port in Wuhan. And in the spring of 1861, Counselor Harry Parkes and Admiral Herbert were sent to Wuhan to open a trading port. On the basis of the Convention of Peking, Harry Parkes concluded the Hankou Lend-Lease Treaty with Guan Wen, the governor-general of Hunan and Hubei. It brought an area of 30.53 square kilometres (11.79 sq mi) along the Yangtze River (from Jianghan Road to Hezuo Road today) to become a British Concession and permitted Britain to set up their consulate in the concession. Thus, Hankou became an open trading port. In 1889, Zhang Zhidong was transferred from Viceroy of Liangguang (Guangdong and Guangxi provinces) to Viceroy of Huguang (Hunan and Hubeiprovinces). He governed the province for 18 years, until 1907. During this period, he elucidated the theory of “Chinese learning as the basis, Western learning for application,” known as the ti-yong ideal. He set up many heavy industries, founded Hanyang Steel Plant, Daye Iron Mine, Pingxiang Coal Mine and Hubei Arsenal and set up local textile industries, boosting the flourishing modern industry in Wuhan. Meanwhile, he initiated education reform, opened dozens of modern educational organizations successively, such as Lianghu (Hunan and Hubei) Academy of Classical Learning, Civil General Institute, Military General Institute, Foreign Languages Institute and Lianghu (Hunan and Hubei) General Normal School, and selected a great many students for study overseas, which well promoted the development of China’s modern education. Furthermore, he trained modern military and organized a modern army including a zhen and a xie (both zhen and xie are military units in the Qing Dynasty) in Hubei. All of these laid a solid foundation for the modernization of Wuhan. The Wuchang Uprising of October 1911, which overthrew the Qing Dynasty, originated in Wuhan. Before the uprising, anti-Qing secret societies were active in Wuhan. In September 1911, the outbreak of the protests in Sichuan forced the Qing authorities to send part of the New Army garrisoned in Wuhan to suppress the rebellion. On September 14 the Literature Society and Gongjinhui, two revolutionary organizations in Hubei, set up joint headquarters in Wuchang and planned for an uprising. On the morning of October 9, a bomb at the office of the political arrangement exploded prematurely and alerted local authorities. The proclamation for the uprising, beadroll and the revolutionaries’ official seal fell into the hands of Rui Cheng, the governor-general of Hunan and Hubei, who demolished the uprising headquarters the same day and set out to arrest the revolutionaries listed in the beadroll. This forced the revolutionaries to launch the uprising earlier than planned. As the revolution spread to other parts of the country, the Qing government concentrated loyalist military forces to suppress the uprising in Wuhan. From October 17 to December 1, the revolutionary army and local volunteers defended the city in the Battle of Yangxia against better armed and more numerous Qing forces commanded by Yuan Shikai. After fierce fighting and heavy casualties, Qing forces seized Hankou and Hanyang. But Yuan agreed to halt the advance on Wuchang and participated in peace talks, which would eventually lead to the return of Sun Yat-sen from exile, founding of the Republic of China on January 1, 1912, the abdication of the Last Emperor on February 12, and the formation of a united provisional government in the spring of 1912. Through the Wuchang Uprising, Wuhan is known as the birthplace of the Xinhai Revolution, named after the Xinhai year on the Chinese calendar. The city has several museums and memorials to the revolution and the thousands of martyrs who died defending the revolution. In early October 1938, Japanese troops moved east and north in the outskirts of Wuhan. As a result, numerous companies and enterprises and large amounts people had to withdraw from Wuhan to the west of Hubei and Sichuan. The KMT navy undertook the responsibility of defending the Yangtze River on patrol and covering the withdrawal. On October 24, while overseeing the waters of the Yangtze River near the town of Jinkou (Jiangxia District in Wuhan) in Wuchang, the KMT warship Zhongshan came up against six Japanese aircraft. Though two were eventually shot down, the Zhongshansank with 25 casualties. The project of building the Wuhan Yangtze River Bridge, also known as the First Yangtze River Bridge, was regarded as one of the key projects during the first five-year plan. The Engineering Bureau of the First Yangtze River Bridge, set up by the Ministry of Railway in April 1953, was responsible for the design and construction of the bridge. The document “Resolutions on Building the First Yangtze River Bridge” was passed in the 203rd conference of State Council on January 15, 1954. The technical conference on the routes of the bridge, held in Hankou on January 15, 1955, determined that the route from Tortoise Hill to Snake Hill was the best choice. On October 25, the bridge proper was under construction. The same day in 1957 the whole project was completed and an opening-to-traffic ceremony was held on October 15. The bridge was 1,670 m (5,479.00 ft) long, of which the superstratum was a highway with a width of 22.5 m (73.82 ft) and the substratum was a double-line railway with a width of 18 m (59.06 ft). The bridge proper was 1,156 m (3,792.65 ft) long with two pairs of eight piers and nine arches with a space of 128 m (419.95 ft) between each arch. Thanks to the First Yangtze River Bridge, Beijing-Wuhan and Guangdong-Wuhan railways were available and any place could be reached from Wuchang, Hankou to Hanyang. Thus Wuhan was a thoroughfare to nine provinces in name and in reality. 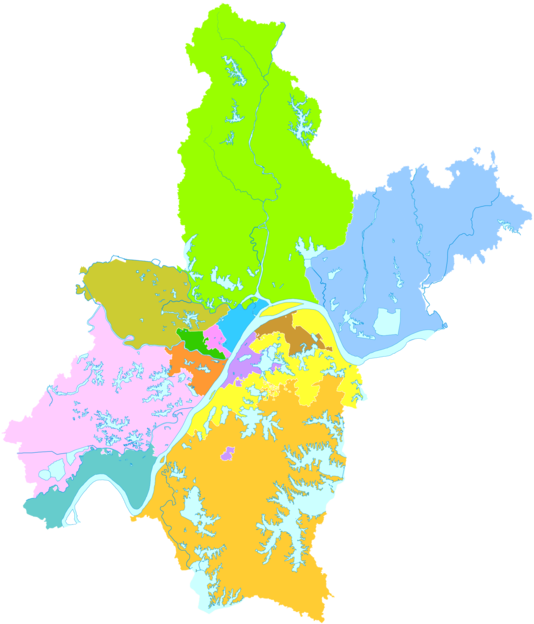 The metropolitan area comprises three parts – Wuchang, Hankou, and Hanyang – commonly called the "Three Towns of Wuhan" (hence the name "Wuhan", combining "Wu" from the first city and "Han" from the other two). The consolidation of these cities occurred in 1927 and Wuhan was thereby established. The parts face each other across the rivers and are linked by bridges, including one of the first modern bridges in China, known as the "First Bridge". It is simple in terrain – low and flat in the middle and hilly in the south, with the Yangtze and Han rivers winding through the city. Wuhan occupies a land area of 8,494.41 square kilometres (3,279.71 sq mi), most of which is plain and decorated with hills and a great number of lakes and pools. Wuhan's climate is humid subtropical (Köppen Cfa) with abundant rainfall and four distinctive seasons. Wuhan is known for its oppressively humid summers, when dewpoints can often reach 26 °C (79 °F) or more. Because of its hot summer weather, Wuhan is commonly known as one of the Three Furnaces of China, along with Nanjing and Chongqing. Spring and autumn are generally mild, while winter is cool with occasional snow. The monthly 24-hour average temperature ranges from 3.7 °C (38.7 °F) in January to 28.7 °C (83.7 °F) in July. Annual precipitation totals 1,269 millimetres (50.0 in), mainly from May to July; the annual mean temperature is 16.63 °C (61.9 °F), the frost-free period lasts 211 to 272 days and annual sunlight duration is 1810 to 2100 hours. Extreme temperatures have ranged from −18.1 °C (−1 °F) to 42.0 °C (108 °F). Wuhan has seven bridges and one tunnel across the Yangtze River. The Wuhan Yangtze River Bridge, also called the First Bridge, was built over theYangtze River (Chang Jiang) in 1957, carrying the railroad directly across the river between Snake Hill (on the left in the picture below) and Turtle Hill. Before this bridge was built it could take up to an entire day to barge railcars across. Including its approaches, it is 5,511 feet (1680 m) long, and it accommodates both a double-track railway on a lower deck and a four lane roadway above. It was built with the assistance of advisers from the Soviet Union. The Wuhan Tianxingzhou Yangtze River Bridge crosses the Yangtze in the northeastern part of the city, downstream of the Second bridge. Its name is due to the Tianxing Island (Tianxingzhou), above which it crosses the river. Built at the cost of 11 billion yuan, the 4,657-meter cable suspension bridge was opened on December 26, 2009, in time for the opening of the Wuhan Railway Station. It is a combined road and rail bridge, and carries theWuhan–Guangzhou High-Speed Railway across the river. The old Dazhimen Station (大智门火车站), the original Hankou terminus of theBeijing-Hankou Railway. Constructed in 1900–1903, it was closed in 1991, after the opening of the present Hankou Railway Station. Construction work is carried out on several lines of the new Wuhan Metropolitan Area Intercity Railway, which will eventually connect Wuhan's three main rail terminals with several stations throughout the city's outer areas and farther suburbs, as well as with the nearby cities of Xianning, Huangshi,Huanggang, and Xiaogan. The first line of the system, the one to Xianning, will open at the end of 2013. The main freight railway station and marshalling yard of the Wuhan metropolitan area is the gigantic Wuhan North Railway Station (武汉北站;30°47′16.81″N 114°18′27.02″E), with 112 tracks and over 650 switches. It is located in Hengdiang Subdistrict (横店街道) of Huangpi District, located 20 km (12 mi) north of the Wuhan Station and 23 km (14 mi) from Hankou Station. When Wuhan Metro opened in September 2004, Wuhan became the fifth Chinese city with a metro system (after Beijing, Tianjin, Shanghai, andGuangzhou). The first 10.2 kilometres (6.3 mi)-long line (10 stations) is an elevated rail (and therefore called 'light rail' in Chinese terminology). It runs from Huangpu to Zongguan in the downtown area of the Hankou District, and it is the first one in the country to use a communication-based train control system (a Moving Block signalling system, provided by Alcatel). The designed minimum interval is only 90 seconds between two trains and it features driverless operation. Phase 2 of this line will extend the length to 28.8 km (17.90 mi) with 26 stations in total. It plans to start revenue service on July 28, 2010. Metro Line 2 opened on December 28, 2012, extending total system length to 56.85 km (35.32 mi). When Line 4 opens at the end of 2014, all three main railway stations of the city will be connected by the metro lines. Plans also exist to extend the metro's Line 2 to Wuhan Tianhe Airport by 2015. Opened in April 1995, Wuhan Tianhe International Airport is one of the busiest airports in central China and it is located 26 kilometres (16 mi) north of Wuhan. It has also been selected as China's fourth international hub airport after Beijing Capital International Airport, Shanghai-Pudong and Guangzhou Baiyun. A second terminal was completed in March 2008, having been started in February 2005 with an investment of CNY 3.372 billion. Jiqing Street (吉庆街) holds many roadside restaurants and street performers during the evening, and is the site of a Live Show (生活秀) with stories of events on this street by contemporary writer Chi Li. The Lute Platform in Hanyang was where the legendary musician Yu Boya is said to have played. This is the birthplace of the renowned legendary of seeking soul mate through “high mountains and flowing water”. According to the story of 知音 (zhi yin, "understanding music"), Yu Boya played for the last time over the grave of his friend Zhong Ziqi, then smashed his lute because the only person able to appreciate his music was dead. Some luxury riverboat tours begin here after a flight from Beijing or Shanghai, with several days of flatland cruising and then climbing through theThree Gorges with passage upstream past the Gezhouba and Three Gorges dams to the city of Chongqing. With the completion of the dam a number of cruises now start from the upstream side and continue west, with tourists traveling by motor coach from Wuhan. Wuhan is a sub-provincial city. Its GDP was 450 billion CNY and GDP per capita was approximately 64,000 CNY as of 2009. In 2008, the city's annual average disposable income was 16,360 CNY. Wuhan has currently attracted about 50 French companies, representing over one third of French investment in China, and the highest level of French investment in any Chinese city. There are 35 higher educational institutions including the well-known Wuhan University, Huazhong University of Science & Technology, 3 state-level development zones and many enterprise incubators. Wuhan ranks third in China in overall strength of science and technology. Wuhan Donghu New Technology Development Zone is a national level high-tech development zone. Optical-electronics, telecommunications, and equipment manufacturing are the core industries of Wuhan East Lake High-Tech Development Zone (ELHTZ) while software outsourcing and electronics are also encouraged. ELHTZ is China's largest production centre for optical-electronic products with key players like Changfei Fiber-optical Cables (the largest fiber-optical cable maker in China), Fenghuo Telecommunications and Wuhan Research Institute of Post and Telecommunications (the largest research institute in optical telecommunications in China). Wuhan Donghu New Technology Development Zone also represents the development centre for China's laser industry with key players such as HUST Technologies and Chutian Laser being based in the zone. Wuhan Export Processing Zone was established in 2000. It is located in Wuhan Economic & Technology Development Zone, planned to cover land of 2.7sqkm. The first 0.7sqkm area has been launched. Wuhan Optical Valley (Guanggu) Software Park is located in Wuhan Donghu New Technology Development Zone. Wuhan Optics Valley Software Park is jointly developed by East Lake High-Tech Development Zone and Dalian Software Park Co., Ltd. The planned area is 0.67 sqkm with total floor area of 600,000 square meters. The zone is 8.5 km (5.28 mi) away from the 316 National Highway and is 46.7 km (29.02 mi) away from the Wuhan Tianhe Airport. The old library of Wuhan University, also appearing in the school's logo. Wuhan is one of the three scientific and education centers of China, along with Beijing and Shanghai. It had the largest number of enrolled college students in the world in 2011. The city of Wuhan has 85 higher education institutions such as Wuhan University and Huazhong University of Science and Technology. Wuhan ranks third in China in scientific and education strength: It contains three national development zones and four scientific and technologic development parks, as well as numerous enterprise incubators, over 350 research institutes, 1470 hi-tech enterprises, and over 400,000 experts and technicians. Wuhan boasts eight national colleges and universities among its 36 colleges and universities. Note: all names of PLA-related schools are not official as they have not provided official translations. Culture Hankou once had an English-language newspaper, The Hankow Daily News, which was published by a German individual. Wuhan natives speak a variety of Southwestern Mandarin Chinese. “No needs to be particular about the recipes, all food have their own uses. Rice wine and tangyuan are excellent midnight snacks, while fat bream and flowering Chinese cabbages are great delicacies.” Hankou Zhuzhici (an ancient book recording stories about Wuhan) produced during Daoguang Period of Qing Dynasty, reflects indirectly the eating habits and a wide variety of distinctive snacks with a long history in Wuhan, such as Qingshuizong (a pyramid-shaped dumpling made of glutinous rice wrapped in bamboo or reed leaves) in Period of the Warring States, Chunbinbian in Northern & Southern Dynasties, mung bean jelly in Sui Dynasty, youguo (a deep-fried twisted dough stick) in Song & Yuan Dynasties, rice wine and mianwo in Ming & Qing Dynasties as well as three-delicacy stuffed skin of bean milk, tangbao (steamed dumpling filled with minced meat and gravy) and hot braised noodles in modern times. Hot and Dry Noodles, Re-gan mian (热干面) consists of long freshly boiled noodles mixed with sesame paste. The Chinese word re means hot andgan means dry. It is considered to be the most typical local food for breakfast.